We’ve watched the dual Anamorphic Equalizers pulse as they guide wannabe Michael Knights across the alkaline flats, but, until now, Mio’s never confirmed whether the Knight Rider satnav was real. Well, it is. 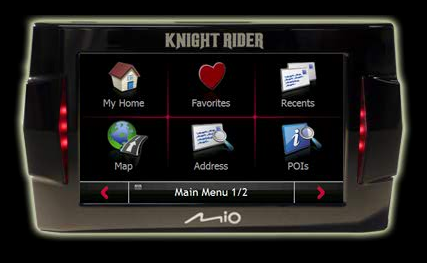 Mio has put fans of 1980s telly out of their panting misery and confessed that it will release the Knight Rider satnav into the wild - well, North America... - next month. As previously reported, the Knight Rider GPS will feature the voice of William Daniels – the man behind KITT. The unit is pre-set to welcome drivers with, “Hello, Michael, where would you like to go today?” but a database of 300 other names lets you choose your own one, unless it’s something strange like Barclay, Barry or Bort. The 181g, 12.8 x 7.5 x 1.8mm unit has a 4.3in, 480 x 272 widescreen "anti-glare" touch-sensitive display and comes pre-programmed with over 4m points of interest - hopefully they’re not all Knight Rider filming locations - and maps for the US and Canada. It also accepts SD memory cards. 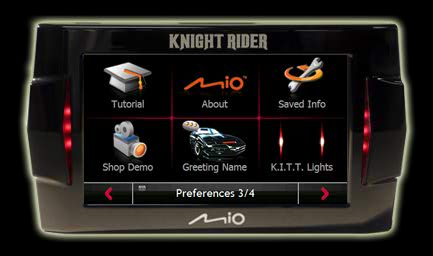 Mio’s Knight Rider satnav will cost $270 (£135/€155) when it’s released in the US. A UK release date or price hasn’t been tracked down yet.